Dow Chemical, General Motors. IBM, Dufont Aloosa, Western Electric, 3H. Mobile C11, Collins Radio, and other big defense contractors. Besides serving the interests of a ruling capitalist class, the University is a vital institutional link in a system devoted to exploiting people for profits. The University itself is a boss to thousands of hospital, cafeteria. secretarial, maintenance and other workers. Although students are taught that workers today are well off, the University pays low wages - less than $2 an hour for many workers. A large pool of students willing to work for low wages keep the wages of full-time workers down and discourage them from fighting back because of the threat of students taking their jobs. While the number of students increases, the number of workers is cut, leaving the remaining workers with more to do. 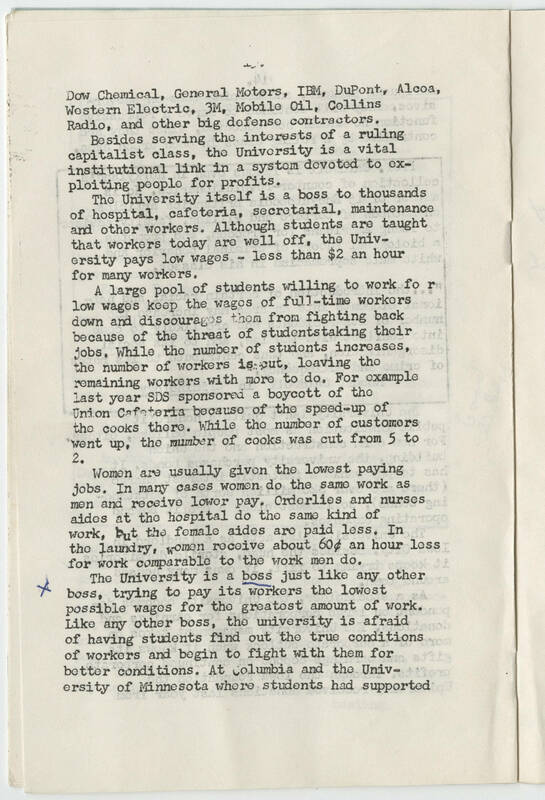 For example last year SDS sponsored a boycott of the Union Cafeteria because of the speed up of the cooks there. While the number of customers went up, the number of cooks was cut from 5 to 2. Women are usually given the lowest paying jobs. In many cases women do the same work as men and receive lower pay. Orderlies and nurses aides at the hospital do the same kind of work, but the female aides are paid less. In the laundry, women receive about 60c an hour less for work comparable to the work men do. The University is a boss just like any other boss, trying to pay its workers the lowest possible wages for the greatest amount of work. Like any other boss, the university is afraid of having students find out the true conditions of workers and begin to fight with them for better conditions. At Columbia and the University of Minnesota where students had supported.